To quote Michael Wright of Vintage Guitar Magazine, “There are bad accidents and there are good, or “happy” accidents. Bad ones are when you bend over, your rear-end knocks over your axe, and suddenly you’ve “created” a headless guitar. 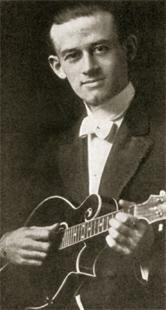 An example of a happy accident is the invention of the Alvarez Dana Scoop.” Another example of a happy accident is finding a Gibson F-5 mandolin in an old barn that was signed by Lloyd Loar on February 18, 1924..
As reported by Gilchrist Mandolins & Guitars, this Gibson Master-Model F-5 Mandolin was found in the mid 90’s “wrapped in plastic, in its case and stored outdoors for years”. Identified by its factory order number (11965) the life of this F-5 started in 1923 at the original Gibson factory in Kalamazoo, MI. All wood pieces (Top, Back, Sides, & Tone Bars, F Holes) were carefully handcrafted by Gibson’s luthiers under the watchful eye of Loar. Each piece was then tap-tuned by Loar and paired with pieces that would produce a perfectly harmonious frequency. 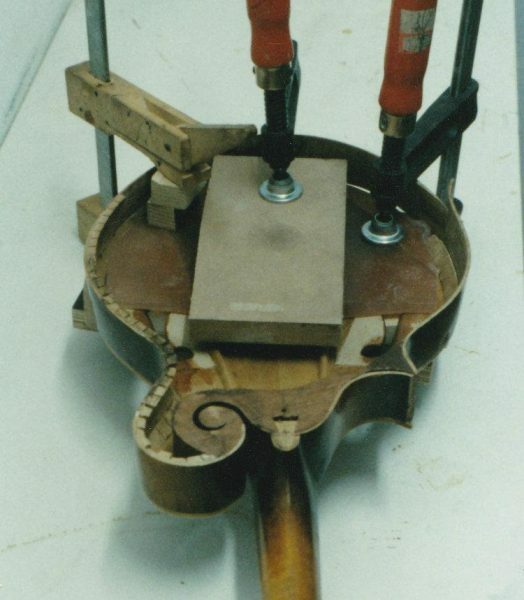 Loar adapted Stadivarius’ technique of “Plate-tuning” (tap-tuning) each piece in perfect harmony, ultimately providing an instrument with more volume and better freq. balance. 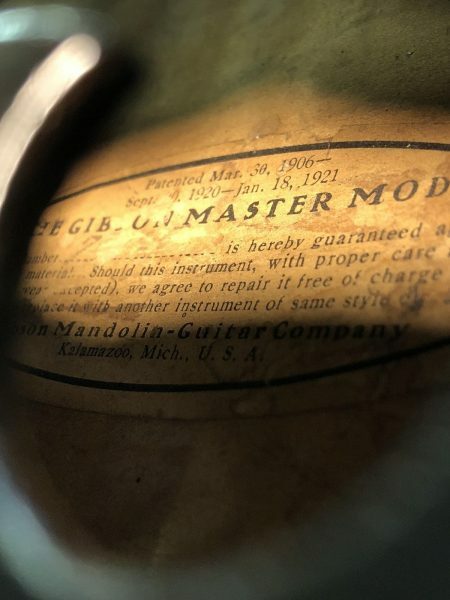 Today(2019) tap-tuning plays a major role in acoustic guitar manufacturing. Without the creation of Loars Master Model Series instruments, more specifically the F-5 Mandolin (& L-5 Guitar), todays “Sound-Box” instruments might have a different voice. 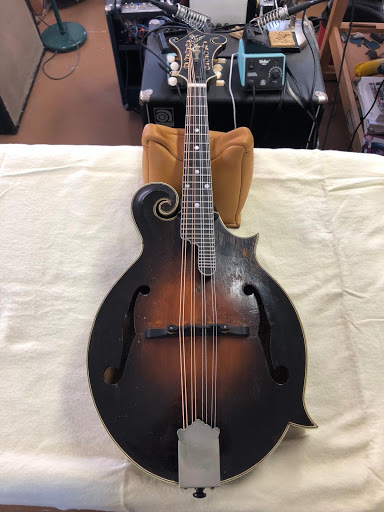 Of the (311) F-5 mandolins that have passed through the hands of Loar in his first floor laboratory at 225 Parsons st. this mandolin is (1) of (247) recorded by Daryl Wolfe (Wolfes F5 Journal). 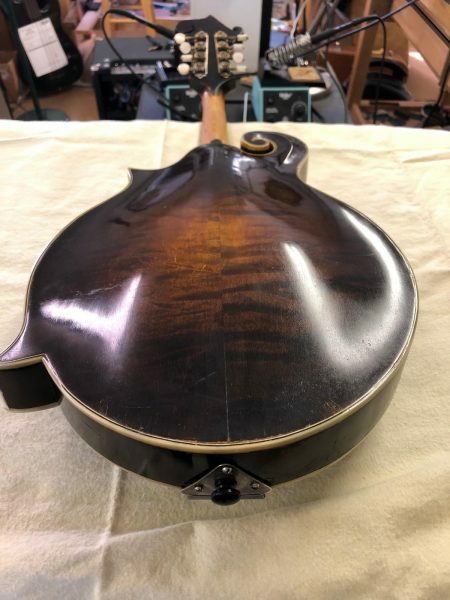 Recently DSR, INC, Master Luthier Dana Sutcliffe had the unique pleasure of restoring an instrument known as the “Holy Grail” of mandolins, a 1924 Master Model F-5 Gibson Mandolin, signed February 18, 1924 by, none other than, Lloyd Loar. 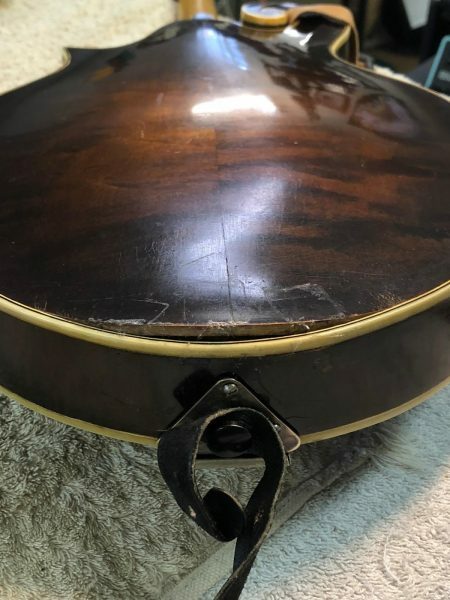 The damage looked obvious, as the back soundboard was coming apart from the heel and binding, as well as cracks starting at the tail guard screws. But to understand what was creating the issue we needed to see what was happening on the inside. 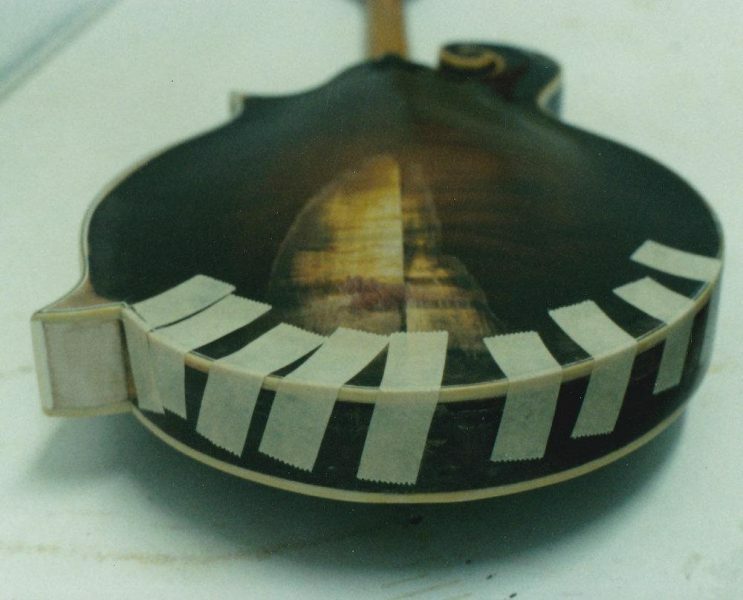 For this task a high definition borescope made it simple for Master Luthier Sutcliffe to identify that defective adhesive was allowing the back soundboard to peel apart from the heel block and was starting to expose the Kerfling. 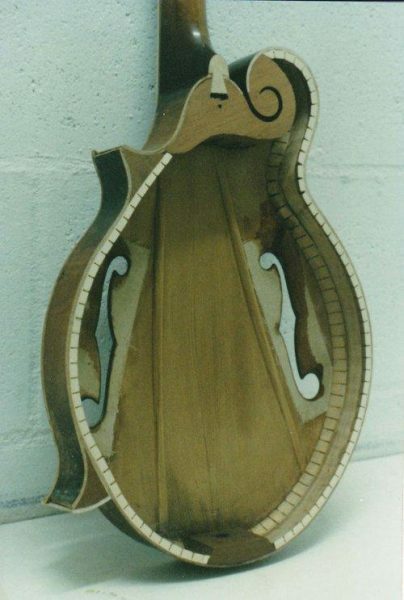 And upon further review, the top soundboard was separating from the sides/heel block, the back soundboard center seam was starting to separate, the fret board was severely damaged w/ binding falling off, and the frets were in terrible shape. All things considered this repair was now a restoration and we had to make plans for our new guest. First step in repairing the bonding issues, was designing a custom jig and clamping system for securing areas needing bonding with an even amount of tension Then after cleaning and prepping each interior area Master Luthier Sutcliffe applied protocol specific adhesive from inside the instrument while monitoring his progress via borescope. 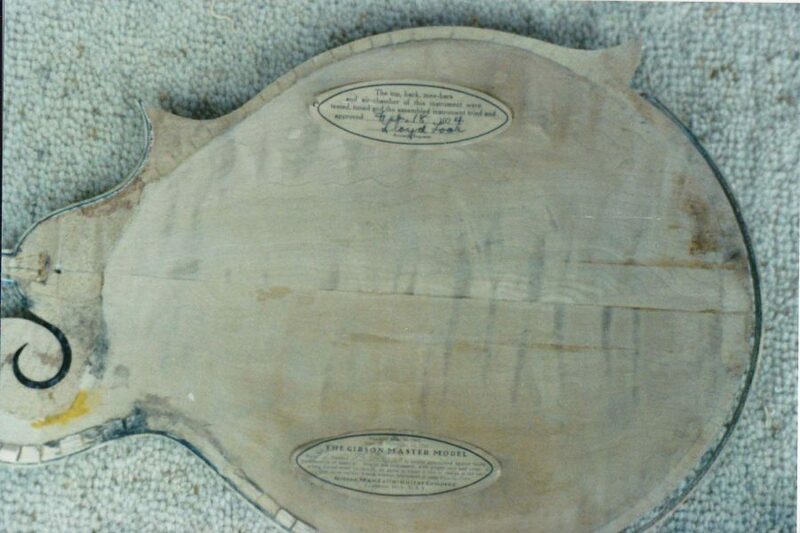 As soon as the curing process was completed it was on to the fingerboard. The fingerboard and frets showed a lot of wear, which was great to see as this means the current owner is an active player. Loar would be pleased. Nonetheless this part of the restoration required securing the binding, carefully removing the frets, planing and slotting the fingerboard. The customer chose a player specific fret size for installation. Prepping frets for installation includes measuring, cutting, and bending fret wire by hand so all 20 frets, plus 9 on the tongue, to match the fingerboard radius for a safe and secure installation. 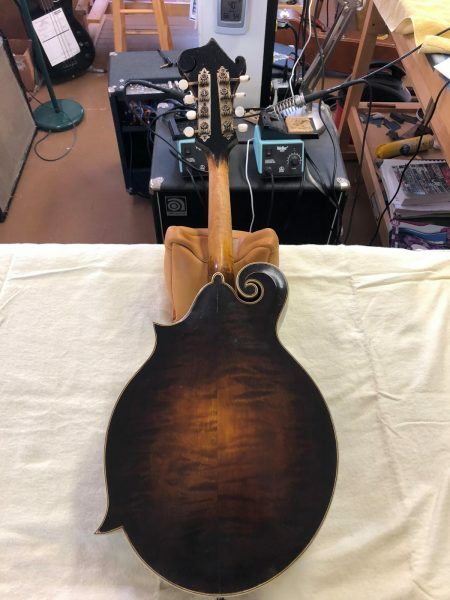 As soon as the 29th fret was installed Master Luthier Sutcliffe resecured neck binding to Loar’s protocol. Once the restoration process was complete it was time to level, crown, and polish the frets for balance string frequency and no string buzz. Removal and replacement of the existing nut which included leveling the nut slot and hand crafting a new bone nut. Installation of new D’Addario EJ75 strings, carving string slots to support the gauge of each string and correct placement of the bridge (13-15/16”) for accurate intonation. The current book value on this F-5 is $156,000 while street value is almost as high as $175,000. This has been one of the utmost wonderful restoration experiences we at DSR, INC have had the pleasure of completing. Our goal at DSR, INC is to preserve the history of every instrument within its original design protocol. Wright, M (2010, January). ‘The Alvarez Dana Scoop’. Vintage Guitar, vol. 24, no. 03.